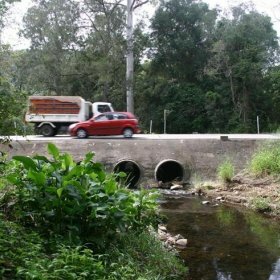 During the later half of 2008, Lambert & Rehbein was commissioned by Department of Transport and Main Roads – South Coast Region (DTMR) to complete a Review of Environmental Factors (REF) for a proposed alignment upgrade (including two creek crossings) on Tamborine Oxenford Road, Wongawallan. 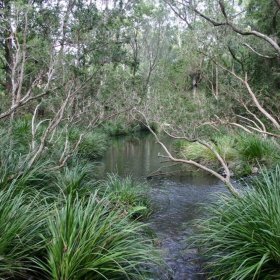 This assessment identified the presence of a number of species of frogs within Tamborine Creek and Wongawallan Creek. Species observed included Eastern Sedge Frog (Litoria fallax), Stony Creek Frog (Litoria wilcoxii) and Green-thighed Frog (Litoria brevipalmata). Of particular note was the Green-thighed Frog which is currently listed as Rare under State Legislation and Endangered under International Documentation. Lambert & Rehbein was subsequently commissioned by the DTMR to compile a Frog Habitat Management Plan (FHMP) to manage construction activities and resultant potential impacts to amphibian habitat associated with works on Tamborine-Oxenford Road. 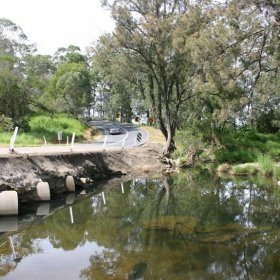 The works include two creek crossings at Tamborine Creek and Wongawallan Creek, demolition and removal of existing causeway structures and installation of a constructed Fishway and associated landscaping/revegetation works. Following liaison with the Department of Environment and Resource Management (DERM), the Queensland Museum and close review of construction drawings, Lambert & Rehbein were able to determine best practice management measures to mitigate potential risks associated with the proposed bridge construction and bulk earthworks. Part of the compilation of this plan also required engagement and liaison with an Erosion and Sediment Control specialist to identify best practice sediment and erosion control methodologies throughout the construction process. The FHMP was one of the first plans successfully generated to this detail and DERM’s requirements.